FIFA 17 will hit the stores later this moth for Xbox One, PS4, PC, Xbox 360 and PS3. With improved graphics, updated rosters and uniforms and the long-awaited career mode that will debut in the game, the game is highly anticipated by fans of the franchise, and they can now experience the game in a free demo. In this guide we will show you the best passes of the game. The attribute "pass" includes several sub-attributes: crossing, curve, long pass, short pass, and precision shot. If a player has the "PAS" high and low precision shot, it means that the most vital sub-attributes to be a good passer. Iniesta is one of the best midfielders of recent times, remains one of the best passes with his 87. Iniesta has the same number in the attribute as the companion of Messi in Barcelona. Despite achieving an average of one assist every three games last season, David Silva missed pass points. The Spaniard had 89 and was in the Top 3 of FIFA 16. Now he had to settle for "only" 87. In addition to the known quality on the right wing, Messi can be lethal when improvised as an attacking midfielder. The reason is his great pass. The tenth and his 86 pass points remain the same as FIFA 16. 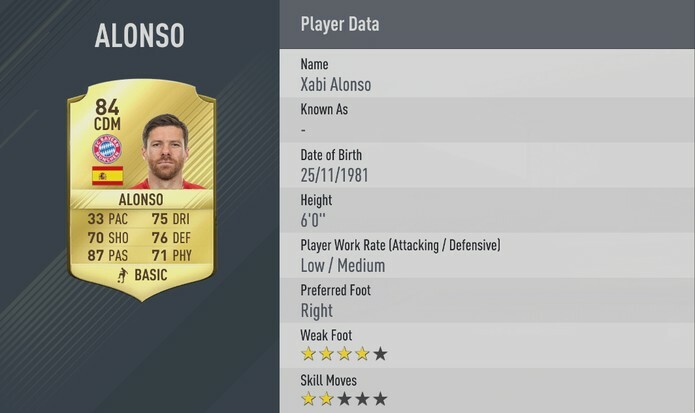 Nearing 35 years of age, it is normal that Xabi Alonso starts to lose points his pass fell slightly, from 88 to 87 in the previous game. Totti rose from ninth to sixth place on the list. The Italian football legend kept his 87 points pass and climbed the squad due to the loss of some competitors, even in his 40s. Parejo is the second classic wheel. His precise passing and good support in attack make him great cheaper option for those who don’t have coins to buy players from Barca or Real in Ultimate Team. The French player made great debut season at West Ham and gave many assists. This ensured an up from 82 to 87 on his pass. German player is probably the best in the world to come out with the ball played from defense to attack - 88 pass. After a magical season of 2014-15, Fabregas and Chelsea fell much income last year. The king of assists in the Premier League lost his post and a pass point. Even so, 89 is enough to ensure Cesc second position for another FIFA. The endless Italian wheel continues as the best passer of FIFA. Pirlo had lost his attribute from 93 to 91, still held the lead in the race for best passers in the game.